A Romanian army fighting vehicle prepares to cross a pontoon bridge across the Danube River. U.S. Army troops from the 4th infantry brigade charge during live-fire exercises at Cincu training grounds in Romania. 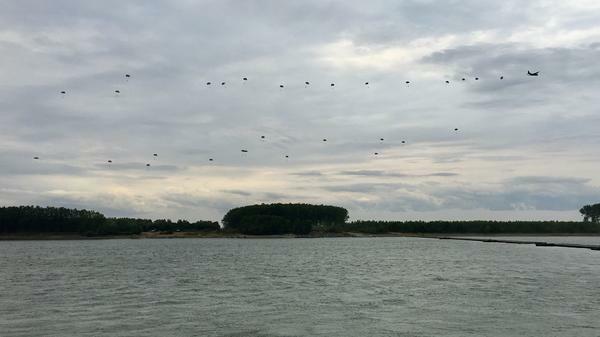 Romanian paratroopers drop from a C-130 transport to a bank of the Danube River. Welcome to Saber Guardian 2017. Billed as "promoting peace and stability in the Black Sea region," it's a U.S.-led multinational military exercise now in its third — and biggest yet-- year in Romania, as well as in neighboring Bulgaria and Hungary. Twenty-five thousand troops from more than 20 nations — most of them members of NATO — have been mustering and carrying out essentially one-sided warfare (since there are no real enemy forces present) for most of the past month in this corner of southeast Europe. When Russia annexed Crimea in 2014, U.S. forces in Europe were at a low ebb. "Three years ago, the last American tank went home — we had zero tanks. Zero in Europe," says Lt. Gen. Ben Hodges, commander of U.S. Army Europe. "But after Russia's invasion of Ukraine and illegal annexation of Crimea, the security environment changed." So did a U.S. defense policy that had pulled out two of four of the Army divisions in Europe. The Obama administration, with strong congressional backing, began replenishing drawn-down forces and equipment along Europe's eastern flank. That so-called European Reassurance Initiative was meant to demonstrate to rattled NATO allies a renewed U.S. commitment to defending Europe from further Russian expansionism. Last year the U.S. quadrupled funding for that effort to $3.6 billion annually and a full armored combat brigade team, complete with 87 Abrams M-1 tanks, was sent on a 9 month rotation to Europe early this year. 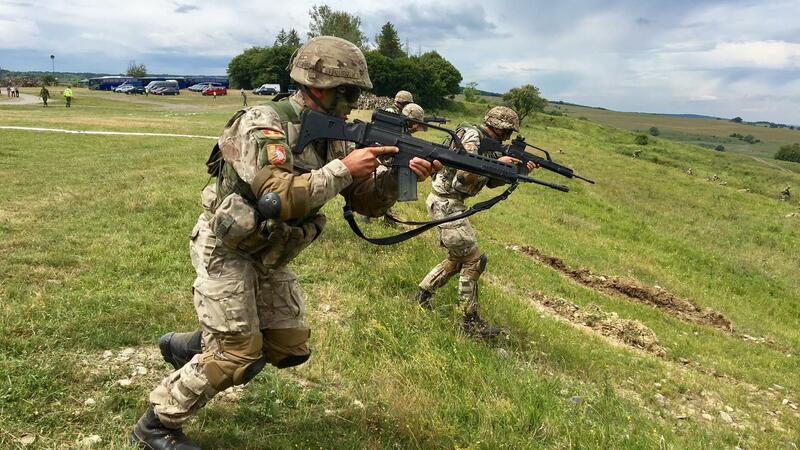 It is troops from that unit who've been taking part in the Romanian live fire exercises at the Cincu training grounds in lower Transylvania. "This is the third brigade, fourth infantry division from Fort Carson, Colorado," says U.S. Army Colonel Jeff Shoemaker, who's in charge of all U.S. training, readiness and exercise programs in Europe. "This is the best-trained brigade in the United States Army." That's because these troops have been doing exercises such as the one in Cincu across eastern Europe with other armies. "We create a scenario that gives us an enemy," says Shoemaker. "This is a scenario that allows us to depict a fictional invading force and gives us an enemy, without being provocative." It's clear, though, that the "fictional enemy" is Russia - especially in Romania. "The Black Sea is the border between Romania and the Russian Federation," says Hodges. "And of course with Russia's illegal annexation of Crimea, Russia has moved that area further to the west." While Hodges insists the maneuvers are all defensive, displaying strength, he says, is key for avoiding armed conflict. "What escalates tensions is when we look weak, not connected, not prepared — that's what invites aggression," he adds. "For 40 years in the Cold War, we had huge militaries facing each other — and 40 years of peace." As a former member of the Warsaw Pact that joined NATO in 2004, Romania still uses Soviet-vintage weapons. But it has boosted defense spending, and by next year Romania should meet the NATO-wide goal of 2 percent of GDP. Much of that spending is for American-made arms such as used F-16 fighter jets bought from Portugal last year. The U.S. State Department recently approved the sale of the Patriot missile defense system to Romania, which would make it the first nation on Europe's eastern flank to acquire these interceptors. "This is living proof of the fact that our soldiers not only talk together, they are able when it is necessary to fight together," says Romanian President Klaus Iohannis while attending the Cincu live fire maneuvers. Asked whether they could deter Russia, Iohannis is categorical. "Of course they could, and I think they do it." Romania's top military officer is a bit less sanguine when asked if he's worried about Russia. "I'm as worried as the (NATO) alliance is," says General Nicolae Ciuca. "Always there is reason to worry. We are not living in a full peace environment." 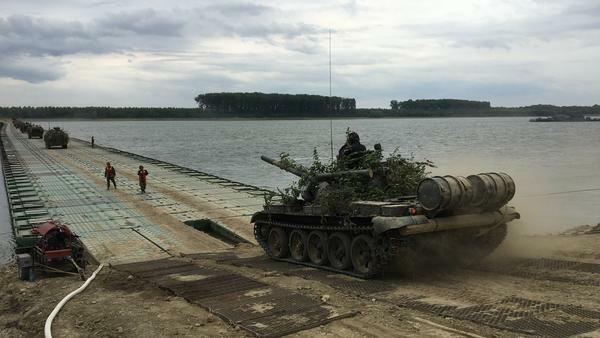 Concerns in Romania about a possible invasion are underscored by a staged river crossing on the Danube in eastern Romania. It features artillery live fire, scores of paratroopers and the installation of a floating bridge. "If you look out here on the Danube River," says U.S. ambassador to Romania Hans Klemm, "you see a lot of Romanian naval capability, riverine capability because they're concerned, worse case scenario, that the Russians would move into the Danube." The Russians are, in fact, preparing an even bigger show of force. It's an annual exercise to be carried out in September in Belarus that is dubbed, suggestively, "West 2017". "People are expecting anywhere from 150,000 to 200,000 troops in what they pretend is a counterterrorism exercise," says a former U.S. ambassador to Moscow and deputy NATO secretary general, Alexander Vershbow. "But it is basically a rehearsal for a full scale war with NATO." That's why U.S. Army Europe commander Hodges is pleased Congress plans to add another $1.4 billion to the European Deterrence Initiative this year. "That's obviously significant and it illustrates the continued commitment of the U.S. to security and stability in Europe, even with a new administration," says Hodges. "Everything that was promised in the last year is happening this year." It's a bulking up of U.S. forces in Europe that President Trump, despite repeated shows of deference to Moscow, has so far done nothing to stop.